This paper builds upon two strategic plans—Every Newborn: An Action Plan to End Preventable Deaths (ENAP) and the Strategies toward Ending Preventable Maternal Mortality (EPMM)6 7—that aim to catalyse global action to eliminate wide disparities in the risk of death and end preventable maternal and newborn mortality and stillbirths within a generation (box 1). We discuss the strategic priorities and essential interventions needed to prevent maternal and newborn deaths and stillbirths and promote maternal and newborn health and wellbeing. A complete review and mapping of the elements of ENAP and EPMM was undertaken. Key themes and strategic objectives that were found to be largely similar are discussed in this paper. Where the emphasis or recommended strategic approach varied based on the target population, and the distinctions were deemed important, specific recommendations were retained. As the era of the millennium development goals comes to a close, more needs to be done for women’s and children’s health. Although maternal deaths declined to 289 000 in 2013,1 the 45% reduction in maternal mortality since 1990 falls far short of the target of 75% in millennium development goal 5. The majority of maternal deaths are still due to direct obstetric causes—that is, haemorrhage (27%), hypertensive disorders (14%), sepsis (11%), and complications of abortion (8%).11 However, a rising number of deaths are related to chronic health conditions in pregnancy, such as diabetes, HIV, malaria, cardiovascular conditions, and obesity (fig 1⇓). Optimal quality of care around childbirth and in the neonatal period could avert 113 000 maternal deaths, 531 000 stillbirths, and 1.3 million newborn deaths by 2020.15 Furthermore, satisfying the unmet need for family planning could prevent 29% of maternal deaths a year.16 Effective care that prevents mortality will also prevent maternal and neonatal morbidities and improve child neurodevelopmental outcomes and long term adult wellbeing.13 17 18 The health and survival of babies and their mothers are inextricably linked, calling for coordinated care before and during pregnancy, in childbirth, and in the postnatal period. We present five priorities, synthesised from the strategic objectives described by ENAP and EPMM (box 2). Health system strengthening must tackle both the hardware (essential health infrastructure, amenities, and commodities) and software (leadership and governance, transparent health information, innovation and private-public partnerships, mechanisms for participation and community engagement, and respectful care norms and values) of health systems.29 In addition, effective referral systems are needed to ensure seamless coordination across time, disciplines, and facilities. Equity is a fundamental human right and a prerequisite to achieving the sustainable development goals. Programme planners need to better understand barriers to access and the personal factors that make care acceptable to all. Equity includes not just access to services but provision of high quality care without discrimination and meeting sustained demand at scale. Gender equality and the empowerment of women and girls are central to a rights based approach. Gender based violence is widespread and its adverse effects include unwanted pregnancies, pregnancy complications including low birth weight and miscarriage, maternal injury and death, and sexually transmitted infections such as HIV/AIDS.32 Strategies for empowering women in their reproductive and maternal healthcare must ensure not only the power of decision making—including whether, when, and how often to get pregnant—but the availability of options they need to exercise their choices. The cost of health services can be a major barrier to care. Up to 11% of the population in some countries incur high out-of-pocket costs for healthcare, with as many as 5% forced into poverty by health related expenditures, including costs associated with essential maternal and newborn care.33 Universal health coverage means reaching all people in the population with essential services and protecting them from financial hardship owing to the cost of these services. Performance based financial incentives and conditional cash transfers have been effective in increasing care seeking and improving quality of care.34 Political and financial decision makers in countries and global donors must prioritise adequate and sustainable resources for maternal and newborn health. Ideally, families protect and care for women and newborns. Men have an important role in safeguarding family health, and they should receive support to do so.35 Evidence shows that women’s groups led by a skilled facilitator can improve maternal and neonatal health through participatory learning, particularly in rural settings with low access to health services.36 Trained community health workers can assist families to strengthen preventive and caregiving practices and facilitate appropriate care seeking. Participatory mechanisms at every level of the health system can help foster community engagement and ensure that services are transparent, inclusive, and responsive to those they serve. Civil society organisations, including parent groups, can contribute substantially to social mobilisation and can hold governments and health services to account for maternal and neonatal health commitments. As the agenda of the sustainable development goals emerges, healthy societies where women, adolescent girls, newborns, and children thrive, and pregnancy and childbirth are safe everywhere, should be at the heart of its ambition. Ending preventable maternal and newborn deaths and stillbirths is possible within a generation and requires focused attention on high impact interventions and strategies to improve access and quality of care. Effective care around the time of childbirth is most critical for survival and health, but comprehensive strategies and high impact interventions should span the continuum of care including before pregnancy. The detailed strategic guidance, specific targets, interventions, and milestones from the ENAP and EPMM global action plans provide guidance for countries to use in their formulation of national health plans and funding priorities. Contributors and sources: DC, BD, RJ, MK, and LS wrote this paper on behalf of the ENAP and EPMM writing groups. We gratefully acknowledge contributions from (in alphabetical order): EPMM: Carla Abou Zahr, Agbessi Amouzou, Isabel Danel, Luc de Bernis, Mengistu Hailemariam Damtew, Lynn Freedman, Metin Gülmezoglu, Rima Jolivet, Marge Koblinsky, Gita Maya Koemarasakti, R Rajat Khosla, Matthews Mathai, Affette McCaw-Binns, Joao Paolo Souza, Annie Portela, Jeffrey Smith, Mary Ellen Stanton, Petra Ten Hoope-Bender, Joshua Vogel, and Mary Nell Wegner. ENAP: Kim Dickson, Joy Lawn, Elizabeth Mason, Lori McDougall, Juana Willumsen, Severin von Xylander. All authors contributed to drafting and reviewing the manuscript. DC, BD, LS are employees of the World Health Organization. The authors alone are responsible for the views expressed in this article, which does not necessarily represent the views, decisions, or policies of WHO or the institutions with which the authors are affiliated. Provenance and peer view: Not commissioned; externally peer reviewed. This is an open access article distributed under the terms of the Creative Commons Attribution IGO License (https://creativecommons.org/licenses/by-nc/3.0/igo/), which permits use, distribution, and reproduction for non-commercial purposes in any medium, provided the original work is properly cited. In any reproduction of this article there should not be any suggestion that WHO or this article endorse any specific organisation or products. The use of the WHO logo is not permitted. This notice should be preserved along with the article's original URL. WHO, Unicef, UNFPA, The World Bank, United Nations Population Division. Trends in maternal mortality: 1990-2013. May 2014. www.who.int/reproductivehealth/publications/monitoring/maternal-mortality-2013/en/. UN Inter-agency Group for Child Mortality Estimation. Levels and trends in child mortality 2014. 2014. www.who.int/maternal_child_adolescent/documents/levels_trends_child_mortality_2014/en/. Cousens S, Blencowe H, Stanton C, et al. National, regional, and worldwide estimates of stillbirth rates in 2009 with trends since 1995: a systematic analysis. Lancet2011;377:1319-30.
WHO. World Health Statistics 2014. www.who.int/gho/publications/world_health_statistics/2014/en/. Kuruvilla S, Schweitzer J, Bishai D, et al. Success factors for reducing maternal and child mortality. Bull World Health Organ2014;92:533-44B. Unicef, WHO. Every newborn: an action plan to end preventable deaths. 2014. www.who.int/maternal_child_adolescent/topics/newborn/enap_consultation/en/. WHO. Strategies toward ending preventable maternal mortality (EPMM). 2015. http://who.int/reproductivehealth/topics/maternal_perinatal/epmm/en/. The Lancet. Every Newborn. May 2014. www.thelancet.com/series/everynewborn. The Lancet. Stillbirth. Apr 2011. www.thelancet.com/series/stillbirth. WHO. Newborn health action plan. Resolution WHA67.10. 2014. http://apps.who.int/gb/ebwha/pdf_files/WHA67-REC1/A67_2014_REC1-en.pdf. Say L, Chou D, Gemmill A, et al. 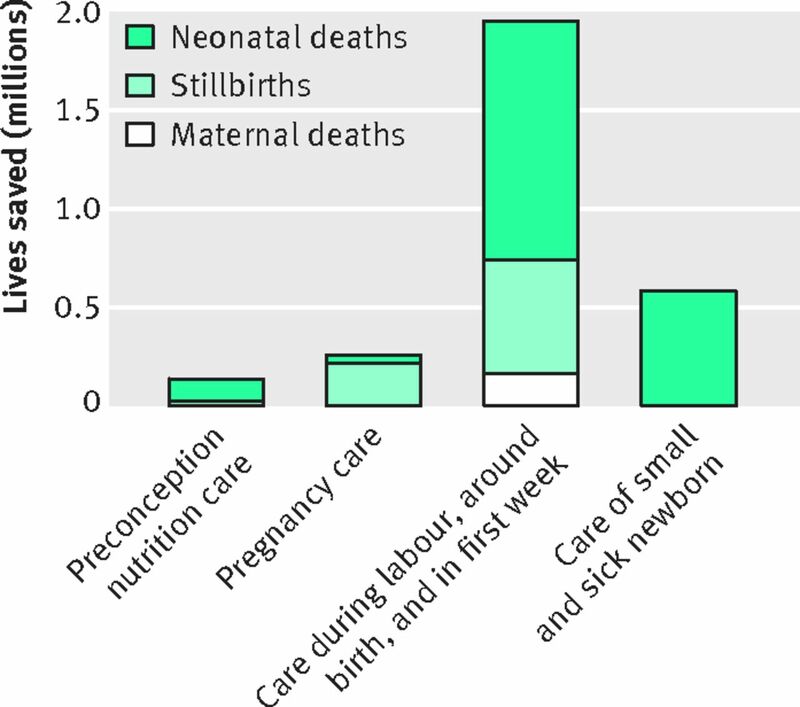 Global causes of maternal death: a WHO systematic analysis. Lancet Glob Health2014;2:e323-33. Liu L, Oza S, Hogan D, et al. Global, regional, and national causes of child mortality in 2000-13, with projections to inform post-2015 priorities: an updated systematic analysis. Lancet2015;385:430-40. Lawn JE, Blencowe H, Oza S, et al. Every Newborn: progress, priorities, and potential beyond survival. Lancet2014;384:189-205. Lawn JE, Blencowe H, Pattinson R, et al. Stillbirths: Where? When? Why? How to make the data count? Lancet2011;377:1448-63. Bhutta ZA, Das JK, Bahl R, et al. Can available interventions end preventable deaths in mothers, newborn babies, and stillbirths, and at what cost? Lancet2014;384:347-70. Ahmed S, Li Q, Liu L, Tsui AO. Maternal deaths averted by contraceptive use: an analysis of 172 countries. Lancet2012;380:111-25. Reichenheim ME, Zylbersztajn F, Moraes CL, Lobato G. Severe acute obstetric morbidity (near-miss): a review of the relative use of its diagnostic indicators. Arch Gynecol Obstet2009;280:337-43. Harrison MS, Ali S, Pasha O, et al. A prospective population-based study of maternal, fetal, and neonatal outcomes in the setting of prolonged labor, obstructed labor and failure to progress in low- and middle-income countries. Reprod Health2015; 12(Suppl 2): S9. WHO, Aga Khan University, PMNCH. Essential interventions, commodities and guidelines for reproductive, maternal, newborn and child health. 2011. www.who.int/pmnch/knowledge/publications/201112_essential_interventions/en/. WHO. Health systems financing: the path to universal coverage. World health report 2010. www.who.int/whr/2010/en/. World Bank. Global financing facility in support of every woman every child. Jul 2015. www.worldbank.org/en/topic/health/brief/global-financing-facility-in-support-of-every-woman-every-child. IEG World Bank, IFC, MIGA. Delivering the millennium development goals to reduce maternal and child mortality. A systematic review of impact evaluation evidence. 2013. www.oecd.org/derec/norway/WORLDBANKDeliveringtheMDGtoreducematernalandchildmortality.pdf. Souza JP, Gülmezoglu AM, Vogel J, et al. Moving beyond essential interventions for reduction of maternal mortality (the WHO Multicountry Survey on Maternal and Newborn Health): a cross-sectional study. Lancet 381:1747-55. Renfrew MJ, McFadden A, Bastos MH, et al. Midwifery and quality care: findings from a new evidence-informed framework for maternal and newborn care. Lancet2014;384:1129-45. Institute of Medicine. Crossing the Quality Chasm: A New Health System for the 21st Century. 2001. http://iom.nationalacademies.org/Reports/2001/Crossing-the-Quality-Chasm-A-New-Health-System-for-the-21st-Century.aspx. WHO. The prevention and elimination of disrespect and abuse during facility-based childbirth. 2014. http://apps.who.int/iris/bitstream/10665/134588/1/WHO_RHR_14.23_eng.pdf?ua=1&ua=1. Kassebaum NJ, Bertozzi-Villa A, Coggeshall MS, et al. Global, regional, and national levels and causes of maternal mortality during 1990-2013: a systematic analysis for the Global Burden of Disease Study 2013. Lancet2014;384:980-1004.
WHO. Safe abortion: technical and policy guidance for health systems. Second edition. 2012. www.who.int/reproductivehealth/publications/unsafe_abortion/9789241548434/en/. Sheikh K, Gilson L, Agyepong IA, Hanson K, Ssengooba F, Bennett S. Building the field of health policy and systems research: framing the questions. PLoS Med2011;8:e1001073. UNFPA. The state of the world’s midwifery 2014. http://unfpa.org/public/home/pid/16021. Tunçalp Ö, Were WM, MacLennan C, et al. Quality of care for pregnant women and newborns-the WHO vision. BJOG2015;122:1045-9. UNFPA, UNIFEM, OSAGI. Combating gender-based violence: a key to achieving the MDGs. 2005. www.unfpa.org/publications/combating-gender-based-violence-key-achieving-mdgs. Meessen B, Soucat A, Sekabaraga C. Performance-based financing: just a donor fad or a catalyst towards comprehensive health-care reform? Bull World Health Organ2011;89:153-6. World Health Organization. WHO recommendations on health promotion interventions for maternal and newborn care. 2015. www.who.int/maternal_child_adolescent/documents/health-promotion-interventions/en/. WHO. WHO recommendation on community mobilization through facilitated participatory learning and action cycles with women’s groups for maternal and newborn health. 2014. www.who.int/maternal_child_adolescent/documents/community-mobilization-maternal-newborn/en/. Oza S, Lawn JE, Hogan DR, Mathers C, Cousens SN. Neonatal cause-of-death estimates for the early and late neonatal periods for 194 countries: 2000-2013. Bull World Health Organ2015;93:19-28. Commission on Information and Accountability for Women’s and Children’s Health. Keeping promises, measuring results. 2011. www.who.int/topics/millennium_development_goals/accountability_commission/Commission_Report_advance_copy.pdf. WHO. The WHO application of ICD-10 to deaths during pregnancy, childbirth and puerperium: ICD MM. 2012. www.who.int/reproductivehealth/publications/monitoring/9789241548458/en/. WHO. Maternal death surveillance and response: technical guidance. Information for action to prevent maternal death. 2013. www.who.int/maternal_child_adolescent/documents/maternal_death_surveillance/en/. Mehl G, Labrique A. Prioritizing integrated mHealth strategies for universal health coverage Science 2014;345:1284-7. Agarwal S, Heltberg R, Diachok M. Scaling up social accountability in World Bank operations. 2009. www.gsdrc.org/go/display&type=Document&id=4062. Every Woman Every Child. Shaping the future for healthy women, children, and adolescents: learn more about the process to update the global strategy. 2015. www.everywomaneverychild.org/global-strategy-2.